Wednesdays have notoriously been crazy chaos days for me! There was a time where I was doing two school runs, home, a collection at midday, home, a collection at 2.30pm, home, hobby run, home, hobby collection and home again! Madness! But it’s all been made much easier with the addition of the school bus for Lily and also a good friend takes her after school now and along with her own daughter they do the hobby run together. I owe this lady a big and fabulous Christmas gift this year because she has made my Wednesdays so much easier. And if you are reading this Miriam…thank you!!!! So today was edging back towards being one if those crazy days! I had a school drop to do (Morgan) then a doctor appointment to have some blood tests done at 10am and last night I was told we have an electrician due to call to run a few repairs. I needed to get prepared for that! Just my luck the work he’s to do takes place is two of the house dump zones! Zone A was the Hotpress in the hall…more of a hot mess! A few months ago it was a Pinterest worthy delight of organized and tidy towels,bed sheets,pillow covers etc! Now,it’s just stuffed! It’s all of the same things plus coats, shoes, discarded Hallowe’en decorations,a few tools, fire extinguishers…the lot! Zone B is the utility room, referred without any affection usually to as the Futility room. This is the laundry dump spot! Piles and baskets of clothes for washing on the floor, piles and more piles of clean and dry clothes on the counters! Always! I suppose the threat of a workman coming in is good enough reason to start tidying these areas for Christmas. I was half way through both jobs when we realized the electrician wasn’t coming at all today! Super! The upside of this anyhow is it did make me go in and at least begin the work! This afternoon I also had a little more of the Santa stock delivered! I usually give out a bit about our postman, he drives way too fast and he’s a bit lazy! Today he earned his Christmas gift tho! He had a large box, two actually,for me and I wasn’t home. I passed him on his rounds tho and he made a big deal of flagging me down, asked had I the kids with me and warned me that what was in the van for me was obviously Santa stuff that they might spot! I was impressed by his concern and the covert ops he was running! He sent me on my way and suggested I hide the kids from the window and he’d follow me back up to our house to smuggle in the goods!! Really good postman work! Bottle of something nice due to him this year! Oh, one more nice thing today! 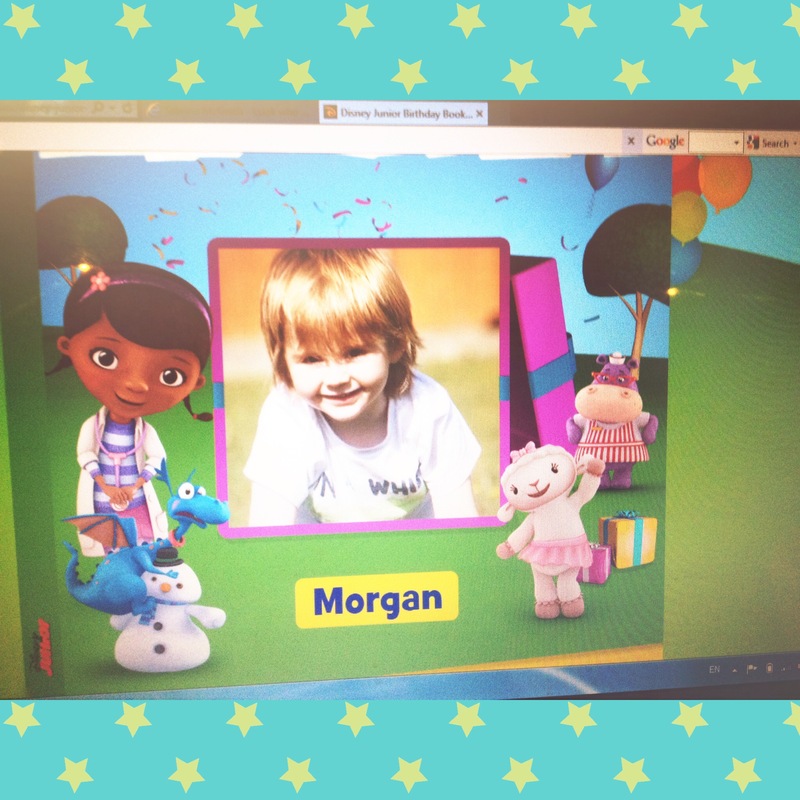 We finally remembered to check out Disney Junior’s birthday book for Morgan’s pic! He was utterly amazed! He has no idea I sent it in, he just thinks Doc McStuffin knew all about his birthday! My gorgeous boy!